Here was Towser’s third Listener. His second was Awful which was an (unsuccessful) attempt to take the Listener down-market with its pun on the old joke “My dog’s got no nose…”! This week there were extra words in eight across and eight down clues, with their first two letters spelling out something helpful. There would also be clashes in five cells that would need resolving and finally extra bars to add to the grid. 1ac Possibly fancying Kate Moss, being rejected after small ball, is stupid meddling (9) looked as though it could be MODEL< after a small ball, but the BEAD for BEADLEDOM would have to wait. However, it didn't have to wait long as BRESCIA went in at 1dn (Italian city cooked crabs, that is (7)), courtesy of Chambers Crossword Dictionary, followed by AUFS at 2 from Forgotten changelings regularly eat up fish (4) (regular letters of eAt Up FiSh). Next came 3dn DRAPPIE and 4dn LAC, and I was feeling happy. It was fairly evident that symmetrical entries would not in themselves give a symmetrical grid and would form part of longer words or need to be truncated somehow. However, that could be dealt with later. 5dn DISA, 7dn CARLS and what looked like USNIC at 9dn but that wasn’t in C. (I really must learn to mark clues for words that the preamble tells me are not in Chambers.) With the top coming together fairly quickly, I worked down the rest of the grid methodically, although not quite as fast as the top. What’s more, after an hour’s solving, and an almost full grid, I didn’t have a single clash! Meanwhile, despite having identified many of the extra words in the clues, they didn’t seem to be spelling out anything meaningful. With the bottom right corner nearing completion, I had already seen GARGANTUA trying to peak through, and there in column 5, PANTAGRUEL confirmed my guess at the theme. 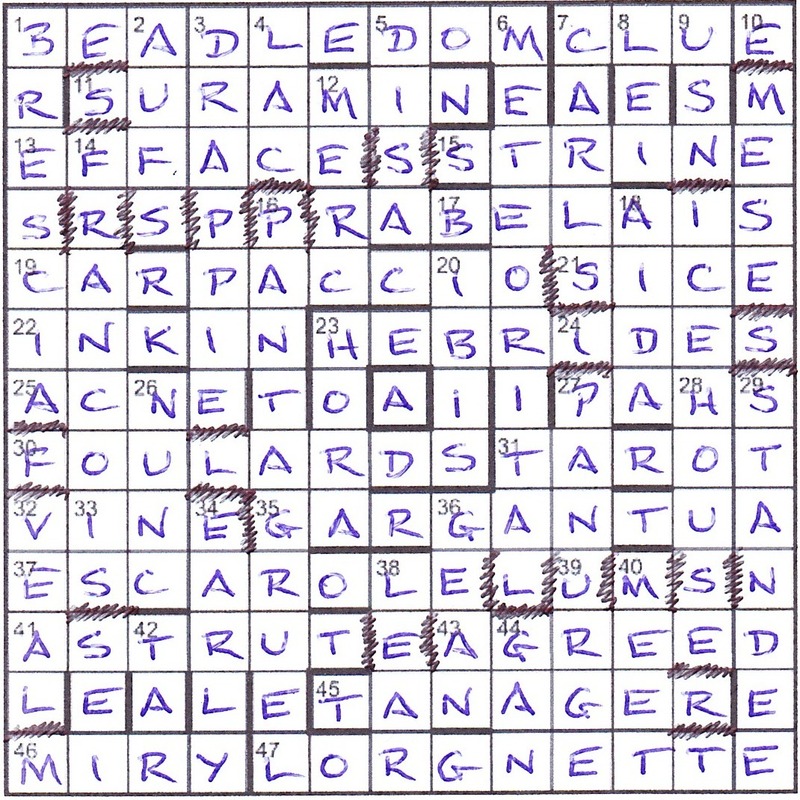 FRANÇOIS RABELAIS provided two more of the unclued entries in the final grid, and as I inked in the required 34 bars, it was satisfying to see the new words being revealed. The central cell still needed completing, and the SW–NE diagonal gave the basis for METAGROBOLISE (not -ize) with an O in the central position. Chambers gives this as “vt to mystify; to puzzle out. [Obs Fr metagraboulizer (Rabelais)” and oddly, not -iser! I must admit that I hate having to draw bars in the endgame as it is so easy to miss one. At least we were told how many, and how many words were in the final grid. It still meant that I had to check and double-check my final entry. And, of course, I had to check the diagonal, only to find that it had to be spelt METAGRABOLISE, to be given by RABELAIS and some extra letters. Many thanks for a very enjoyable puzzle, Towser. It was a fascinating construction, and great fun uncovering the theme and seeing the final grid being revealed — especially the central O A. This entry was posted on 7 April 2017 at 4:00 pm	and is filed under Solving Blogs. Tagged: Got Me!, Towser. You can follow any responses to this entry through the RSS 2.0 feed. You can leave a response, or trackback from your own site.